The powerful grassroots organization of center-left Democrats, MoveOn.org, has called for a boycott of the annual AIPAC conference. It is a potential watershed moment. MoveOn.org was founded in 1998 by tech entrepreneurs Joan Blades and Wes Boyd, a husband and wife team behind Berkeley Systems. It came initially out of an email campaign aimed at preventing the impeachment of Bill Clinton, arguing that Congress should censure him and “move on.” The emails went viral, tipping Blades and Boyd to the potential of grassroots internet organizing as opposed to depending on corporate sponsors. *made one of his coalition partners ally with the Kahanist Jewish Power faction; Kahanists are considered terrorists by the US government. DC hit peak hypocrisy recently when AIPAC partisans in Congress actually implicitly condemned Rep. Ilhan Omar for “racism” for pointing out that AIPAC directs its affiliates to give money to congressional campaigns in order to influence-peddle for the terrorist-allied, racist Netanyahu government. *AIPAC spent tens millions of dollars in 2015 to defeat the Iran nuclear deal negotiated by President Obama along with our European and international allies––a historic diplomatic agreement that Trump has tried to derail since taking office. *This year’s AIPAC conference is headlined by Benjamin Netanyahu … who has been indicted on bribery and fraud charges, and recently made a deal to bring the “Israeli KKK” … party into the next government. 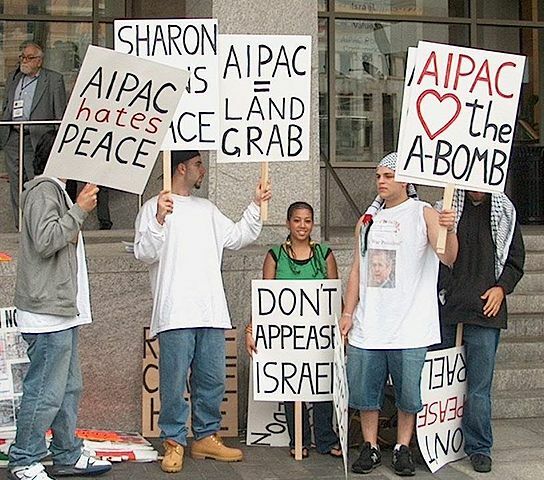 *AIPAC has … been known to peddle anti-Muslim and anti-Arab rhetoric while giving platforms to Islamophobes.